Another lovely period photo received from Tom Robinson, Editor of the Sheffield Transport Study Group (UK) saying he spotted this photograph in Vintage Commercial issue for May 1963 and thought it would be an interesting item for their magazine, but can we identify it? Sheffield issue W 999 would be about 1906. -- Bit later. 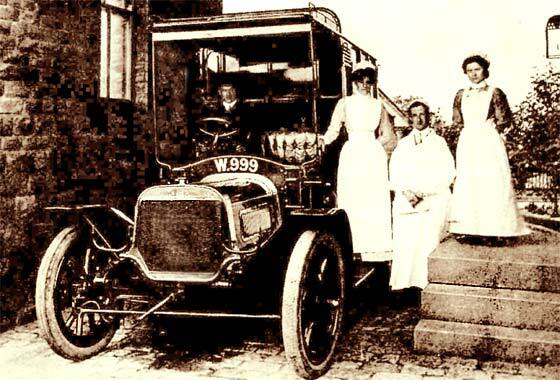 Number of our experts agree this is a cca 1909 Argyll Ambulance, possibly on the 16'20 chassis. Cars had rectangular rad core but commercials fancier bottom. Lovely period photo from Peter Anderson (UK) showing grandfather Raymond Gorton on right had side of the runner. Grandfather's mother was the grand-daughter of Samuel Watts who was the co-founder of Watts Warehouse in Manchester, then the largest single-occupancy textile warehouse in Manchester. 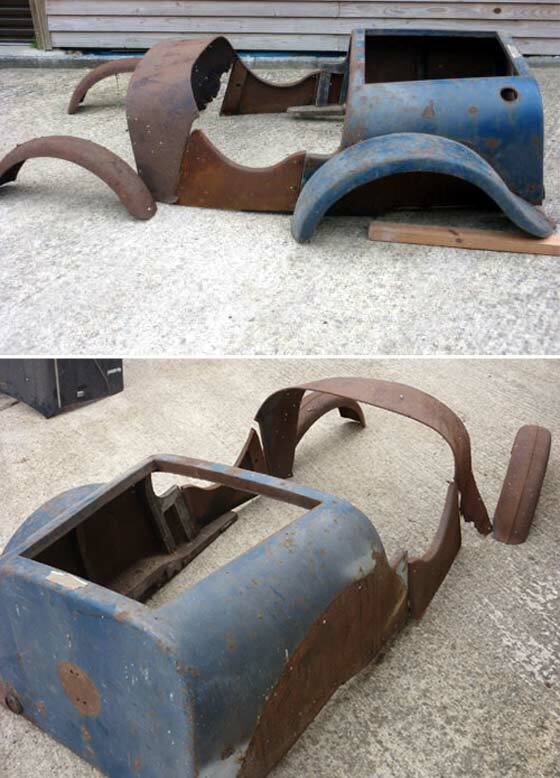 -- This took a little sorting out and thanks to lots of help we can advise this is a French cca 1909 Peugeot Type 117A Landaulette, four cylinder 4.6 litre. A posh car at over £500. Cinema screen grab from a Yugoslav co-production film "Assassination in Sarajevo " made in 1975 where the cars are being investigated by IMCDB. 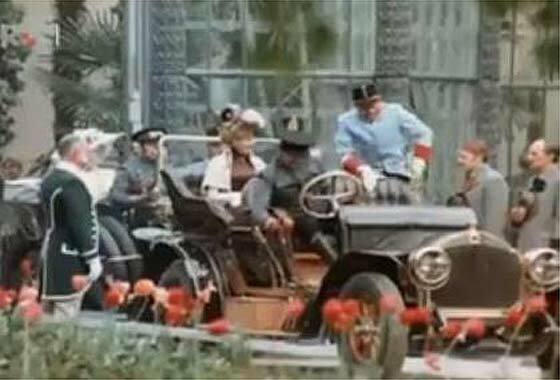 The film is about the assassination of Franz Ferdinand and start of WW1. -- Not a country noted for interest in old cars so all are a bit strange and had a Czech bias. 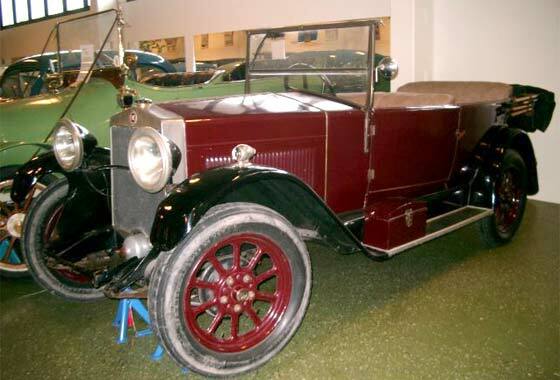 This one was a puzzle until Ariejan Boss advised this car was made by the Reichenberger Automobil Fabrik, now Liberec CZ R, and that the car is cca1909 RAF Type H10 Double Phaeton. One of a couple of photos received from Pär Sörliden (Sweden) which he took at the Laganland Car Museum in Sweden about seven years ago. He does not have any other information than that the museum said the Opel is from 1909. -- The museum does not feature on the Laganland website, so could be closed. The bodywork seems 1909 but the rad does not. Probably Opel but badge is missing. 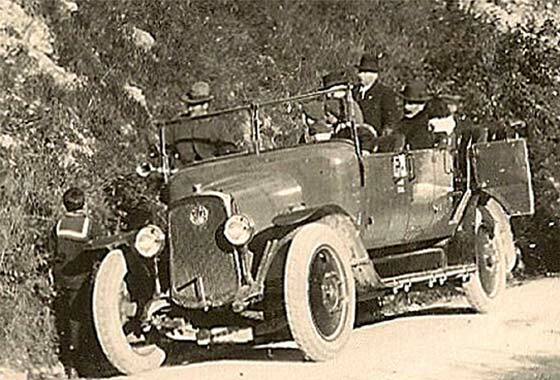 Radiator, square lipped mudguards, and wheelnuts, are more like a cca 1912 Opel 16'35 Tourer. Lovely period photo from Bill Stothard, Cudworth Local History Groupon (UK) saying he knows that commercial vehicles are not our specialty, but can we help with the identification of this truck. 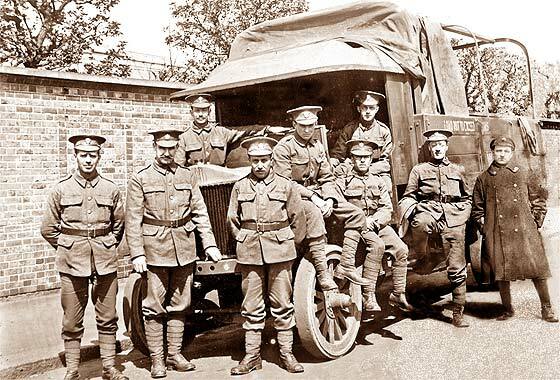 Second from left is Oliver Fry Stanley who served WW1 in RASC in Italy, France & Egypt. -- Identification from Mike Sutcliffe saying this is American cca 1917 Riker Military Truck, just after they changed name from Locomobile. 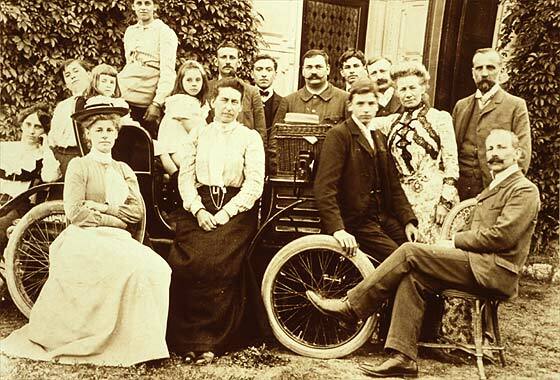 Andrew Riker built electric cars in 1887, and became Locomobile technical brain. Lovely period photo received from George Fridlington (UK) saying he is currently tracing his ancestors and has this picture of his Ggreat /Great Grandfather, a Mr. Singleton taken outside his home in Aldeney Edge, Cheshire. Can we advise make of car and date made . 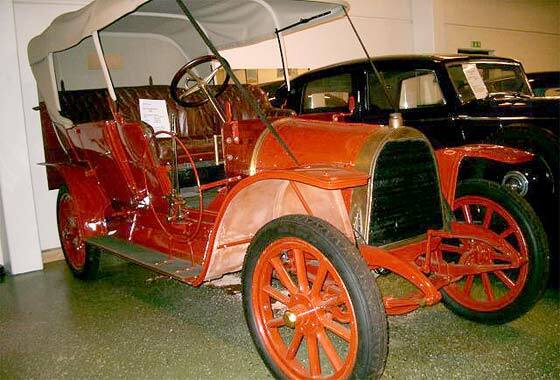 -- This is an early cca 1919 GN Standard Cyclecar designed by H.R. 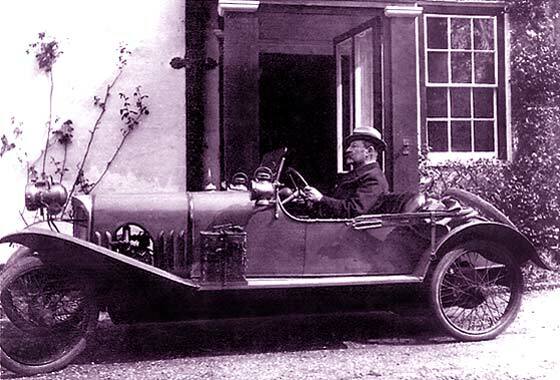 Godfrey and Archibald Frazer Nash. This car has gas lighting. Company restarted after WW1 in 1919. Became British Gregoire and later licenced to French Salmson Co. Interesting photo spotted by our Publicity Officer Tony Russell in a cafe in Reigate, Surrey (UK) while waiting for a cup of coffee, and he was interested to know what it was as the photo was not marked ? -- British Car with a very German name. This is a cca 1924 Horstman 9'20 HP Four Seat Tourer, made in Bath Somerset. Make can be determined from the very unique radiator top and the model/year from the headlamps on the wings. Started 1914, made 1,500 cars, raced in '20s, ended 1925. One of a couple of photos received from Pär Sörliden (Sweden) which he took at the Laganland Car Museum in Sweden about seven years ago. He does not have any other information. -- The museum does not feature on the Laganland website, so could be closed. The car is a cca 1925 Fiat 509 Two-Door Torpedo. 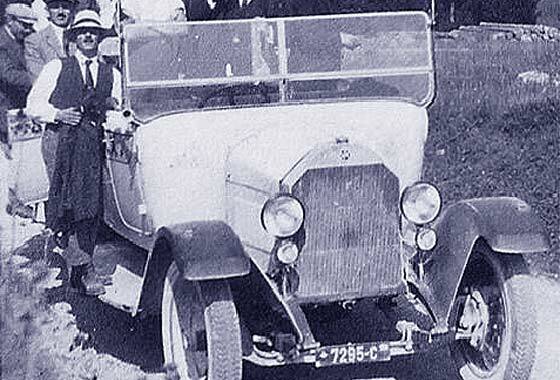 It is a four seater, it has no bulge bonnet-to-the-bodywork, has a windscreen support frame, but appears to have American style headlamps, and has a curved headlamp tie bar. Another puzzling photo received from Numaweb site (Switzerland) with a request for the identification of the vehicle. 'Congratulations you are too strong!' No further background on the picture was provided. -- We asked for a higher resolution copy of the photo and for some further background on the event, but have not received any subsequent replies. 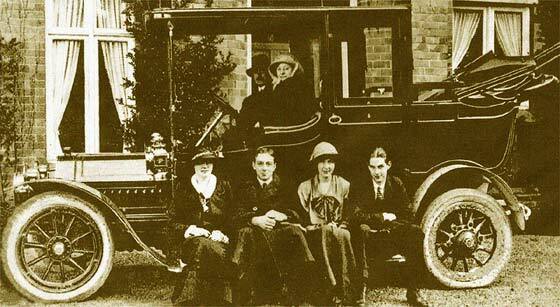 We can advise that this is a French cca 1927 Latil Charabanc, probably based on the 1.5 ton Chassis. Became part of Saviem in 1955. 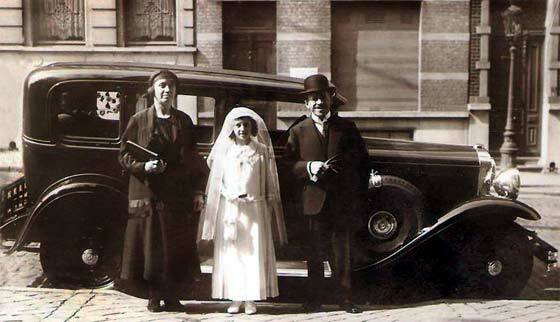 Another from a batch of photos received from Georges Truffaut (Belgium) from postcards they are trying to identify. He thinks the first looks like a military vehicle, could it be FN? -- Not Belgian nor a military vehicle. Made by the 'Steam Driven Car Co', later DKW, in Germany. Became world's largest motorcycle manufacturer in 1930s. Merged with Audi, Horch and Wanderer to form Auto Union. Last DKW car made in 1966. This is a 15hp two-stroke 584cc twin cca 1929 DKW P15 Cabriolet. Another from a batch of photos received from Georges Truffaut (Belgium) from postcards they are trying to identify. He thinks this car could be from the USA possibly Buick ? -- Pressed steel wheels so we thought German rather than American. As the original photo is of small resolution, we requested a bigger version but did not get one. 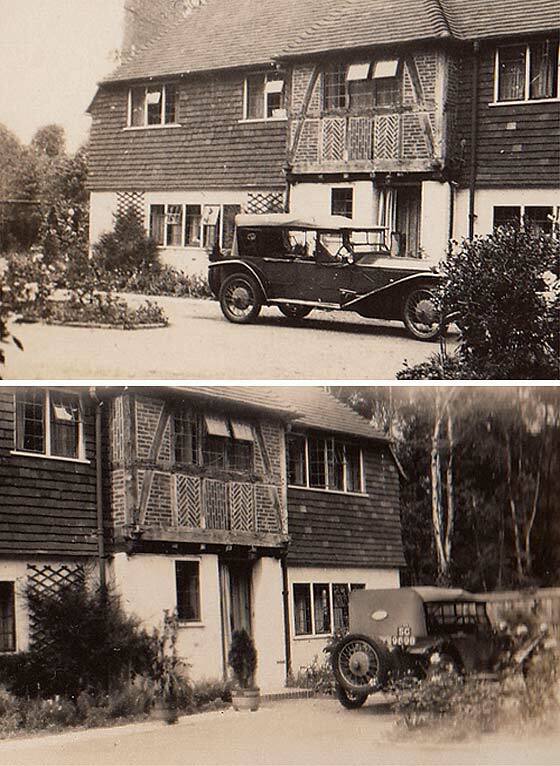 Therefore we had a bit of a guess at either Audi or Horch. 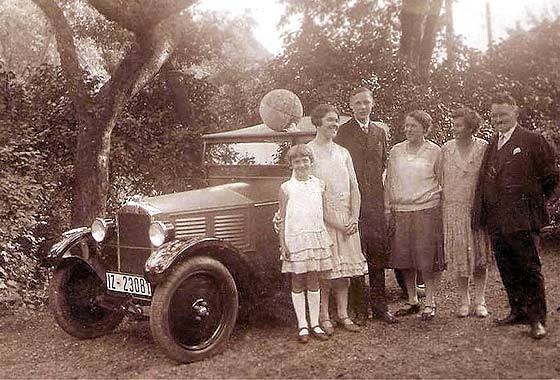 George however is sure it is a cca 1930 Buick 40 Sedan, so we had a review and agree could be. Lovely photos received from Trevor Stewart, New York (USA) saying he came across our amazing website and could we help with identifying these taken at his great grandfather Edwin John's home in West Clandon, Surrey, UK. -- SC is a Scottish Edinburgh registration and 9000s were in 1931. This is rather interesting because the car is therefore an Italian cca 1931 Lancia Lambda Torpedo which were made only up to 1931, so this could be one of the last made. V4 2569cc 69HP. 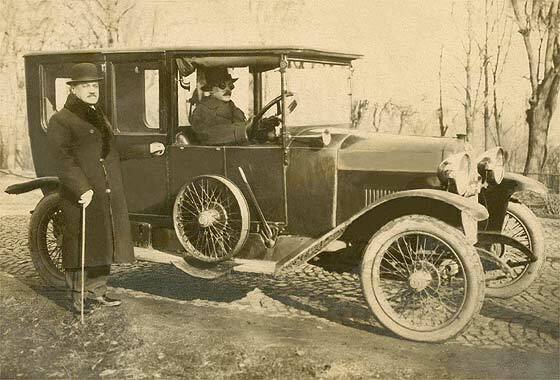 Another lovely period photo received from David Milsom (UK) saying his Mother is in the car and Grandfather is next to it. It did not belong to either but possibly to the owner of the mill where Grandad worked as Engine Tenter, in Meltham, West Riding of Yorkshire. The date on the back is 1933. -- Our MG experts scratched heads a bit, not J or K or N, so eventually agreed this is a cca 1933 MG Model L2 Magna. Has a vacuum windscreen wiper motor, flared wings, and split seven louvers. Quirky photos received from Simon Powell (Caymen Islands) showing his father aged 24 and his younger sister Anne. They lived with parents in Cheadle Hulme, Manchester. Car was bought for £15. Mother said the car was a wreck and doors would fly open on bends. Used house bolts to keep them shut. Father always used to tell her it was a Rover, but that's to be taken with a pinch of salt. -- Not a Rover but a 1934 Singer 11HP Saloon. Apparently stated by Singer as one of the best cars they made. Another photo received from Charles Mercure (France) saying 'Since you are doing such a good job, here attached is another request'. 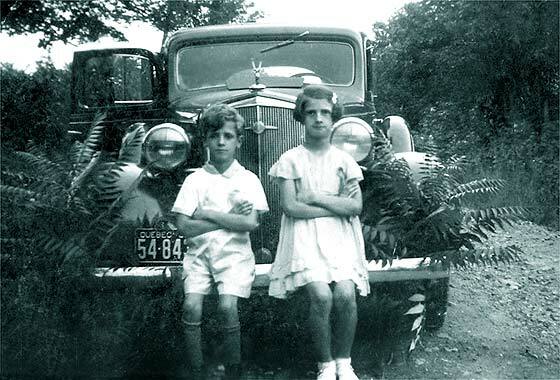 License plate is 1938, the car belongs to my grandfather, children are mother's sister and brother, the setting is rural, north from Montreal, visiting relatives. 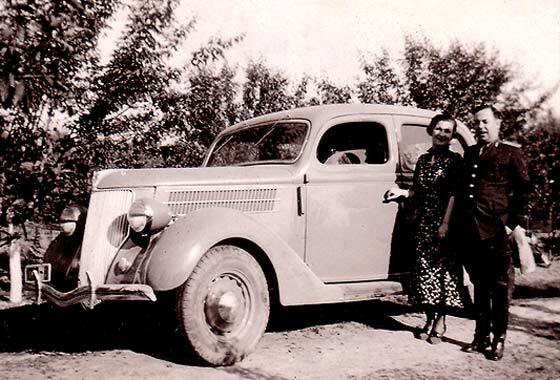 -- Car is American, same year, make and model as the previous photo but is a cca 1935 Chevrolet Model EC Sedan. Could be on the model change to 1936 because the front door is opening rearwards. Lovely period photo received from Charles Mercure (France) saying the photo was taken in downtown Montreal, Canada, in the mid 1930's. 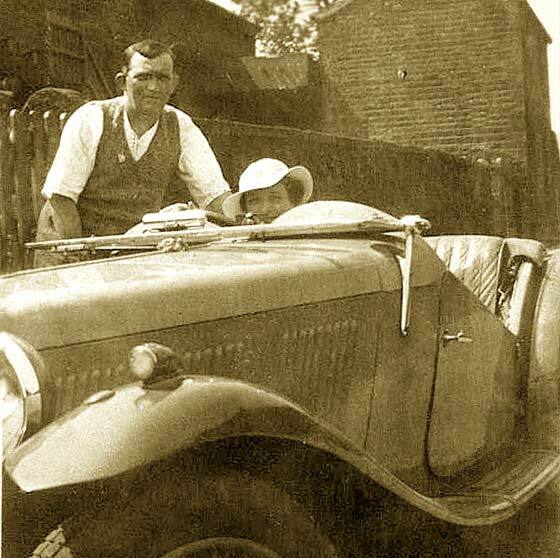 The car belonged to his grandfather and the little girl is his mother. Location is close to grandfather's shop. -- Car is American and is a cca 1935 Chevrolet Model EC Phaeton. Dating is pretty accurate from the badge on the radiator (started 1935) and three bar louvre (only two in 1936) and as this vehicle is a convertible soft top it could not be the model ED. Another from a batch of fascinating photographs from our regular contributor Cicos Florin in Constanta by the Black Sea (Romania) who is interested in old cars of Romania. Do we know what this is? -- Yes we do, after a couple of recent failures! This one is American again, and can be dated from the grille and the louver pattern to to one year, 1936. This is a cca 1936 Ford Model 68 Fordor DeLuxe Sedan. 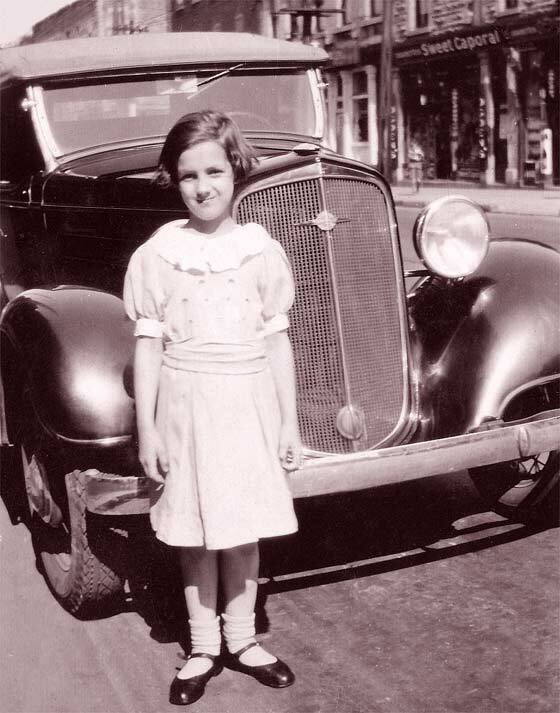 DeLuxe cars had twin horns placed behind small grilles in the wings below the headlamps. 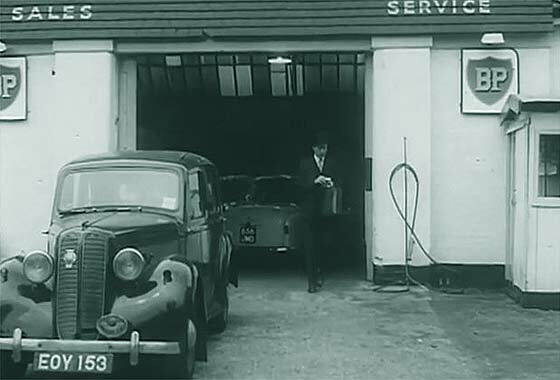 Cinema screen grab from a British film "The Adventures of Hal 5" made in 1958 where the cars are being investigated by IMCDB. The film is for children about a car registered HAL 5 purchased by a local vicar. Local garage owner attempts to swindle the car away but is thwarted by vicar's nephews. -- HAL 5 is a 1928 Austin 7. 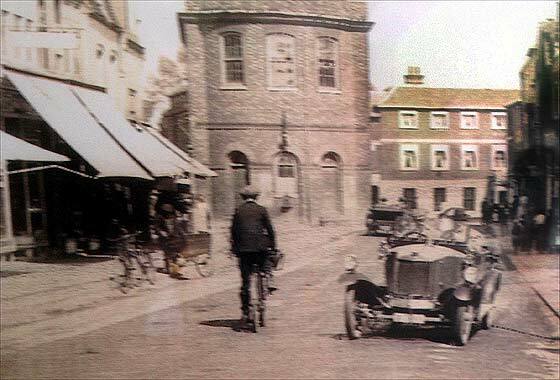 The car in the foreground of this shot is a cca 1939 Hillman Minx registered at Croydon CBC. Looks like a 1956 Middlesex registered Hillman Minx Convertible in the garage. 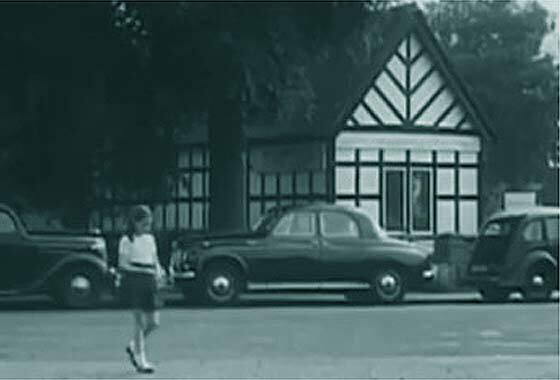 Cinema screen grab from a British film "The Adventures of Hal 5" made in 1958 where the cars are being investigated by IMCDB. The film is for children about a car registered HAL 5 purchased by a local vicar. Local garage owner attempts to swindle the car away but is thwarted by vicar's nephews. -- HAL 5 is a 1928 Austin 7. The car being investigated in this instance is the one in front of the house. This is a cca 1957 Rover 60 P4 Saloon , 2L 60BHP engine which was used in the Early Land Rover. 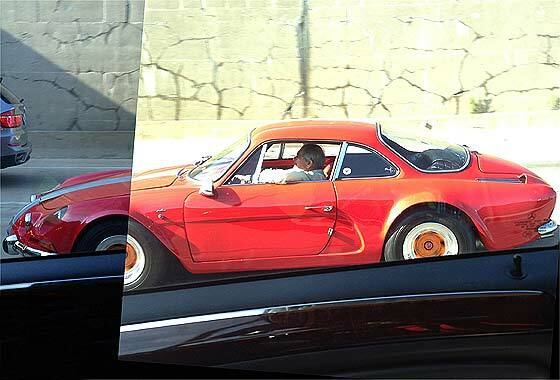 A number of sectional photos received from Ted Green (USA) asking if we can identify this car he spotted on the road in Chicago and photographed on the move. -- The Car is French, made by the company Alpine (pronounced Alpeeen) started by Jean Redele, a Dieppe Renault dealer. Cars used rear mounted Renault engines of the uprated Dauphine and Gordi types. This one is a cca 1971 Alpine Renault A 110. Alpine won the Monte Carlo in 1971/3. Renault bought them out in 1973. Interesting photo being investigated by George Layton (Thailand), asking if it is a Japanese car ? -- Yes, actually a Nissan Micra known in Asia as the Nissan March, bodied by the Japanese automobile company Mitsuoka Motors in Toyama City, who are a coacbuilding company which puts own bodies on current production Nissans. 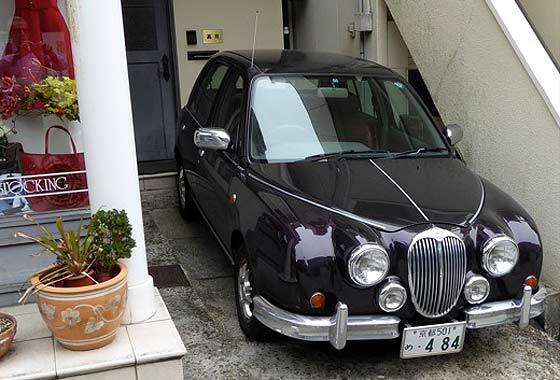 This is a cca 2000 Mitsuoka Viewt K11 which is supposed to resemble the the British 1963 Jaguar Mk 2. Has 1L or the 1.3 L engine, manual or auto, leather extra. Very puzzling photo received from Tobias Frank (Germany) doing genealogical research on his family, possibly taken in the Benelux area or France. -- Not really possible to hide very much more of the car!! No specific ID features are visible. All our experts have come up with a different make. Suggestions include Opel Lutzman, Vivinus, and De Dietrich (Amedee Bolle). To me, tubular chassis, rear spring hanger and steering link suggest a cca 1901 Georges Richard 3.5 Pony Voiturette. Another from a batch of fascinating photographs from our regular contributor Cicos Florin in Constanta by the Black Sea (Romania) who is interested in old cars of Romania. Do we know what this is? -- No, and neither it seems does anybody else!! We have tried all our in-house and external experts and our friends at the AACA in case it was American. Nobody had any ideas although consensus has it at European. Blurry wheel logo possibly suggests AK? So, Unknown Open Drive Limousine. Another puzzling photo received from Numaweb site (Switzerland) with a request for the identification of the vehicle. 'Congratulations you are too strong!' No further background on the picture was provided. -- We asked for a higher resolution copy of the photo and for some further background on the event, but have not received any subsequent replies. None of our experts have come up with an answer. From the wheels, it Looks like a car based charabanc. Any help much appreciated.